Unemployment in Scotland rose by 6,000, to 234,000 in the period November to January 2012, according to Office for National Statistics (ONS) data released today. The Scottish unemployment rate is 8.7 per cent, above the UK average of 8.4 per cent. The labour market statistics also show employment in Scotland has decreased by 11,000 over the three months to November to January 2012. The number of those in employment in Scotland now stands at 2,463,000. “These figures reflect the challenging economic climate. They are a strong reminder that getting people into work is our first priority, especially as the Scottish unemployment rate remains above the rest of the UK. “We are doing all we can to get Scotland working. The UK Government is laying the foundations for more sustainable growth in Scotland and creating the conditions for businesses to invest in good quality jobs. “Our primary goal is to get young people into employment and tomorrow I will chair the first National Convention on Youth Employment in Dundee. We will bring together Ministers from both the UK and Scottish Governments with public and private sector organisations to work together for the benefit of our young people in Scotland. “We also want to support our unemployed young people and this is why the Government is introducing a Youth Contract worth almost £1bn over the Spending Review Period. - Employment in Scotland fell by 11,000 over the quarter, and fell by 17,000 over the year to stand at 2,463,000. 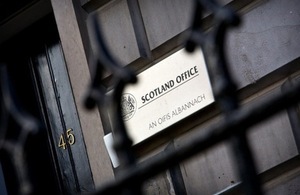 - The Scots employment rate fell over the quarter to 70.8 per cent. The rate is above the UK average of 70.3 per cent. - Unemployment in Scotland increased by 6,000 over the quarter and rose by 18,000 over the year. The level now stands at 234,000. - At 8.7 per cent, the Scots unemployment rate is now above the UK rate as a whole which stands at 8.4%. - Economic Activity fell by 5,000 over the quarter and now stands at 2,697,000. The Economic Activity rate decreased over the quarter, and stands at 77.7 per cent. - In February 2012, the number of people out of work and claiming Jobseeker¿s Allowance (JSA) was 142,800. The Labour Force Survey (LFS) indicates that the number of people in employment in Scotland from November to January 2012 was 2,463,000. Employment was down by 11,000 compared to the previous three months, and is 17,000 lower than the same quarter last year. The employment rate was down on the previous quarter by 0.3 per cent, and fell 0.1 per cent over the year, to 70.8 per cent. In comparison, the Scottish employment rate is above the UK average. Unemployment in Scotland was up 6,000 over the quarter November to January 2012, to 234,000. The level was up 18,000 compared to the same quarter last year. The unemployment rate was up by 0.2 p.p. on the previous quarter at 8.7 per cent, which is up 0.7 p.p. over the year. The claimant count in Scotland, based on the seasonally adjusted number of people claiming Job Seeker’s Allowance (JSA), increased by 600 from January to 142,800 in February 2012. The level is up by 5,400 on February 2011. The claimant count rate remained unchanged over the month at 5.3 per cent, and up by 0.2 p.p. over the year. The number of economically active (defined as those in employment or ILO unemployed, and seasonally adjusted) in Scotland in the November to January 2012 quarter was 2,697,000. This was down 5,000 on the previous quarter, and is up 1,000 on the same point a year ago. Among those aged 16-64 the economic activity rate was 77.7 per cent, a decrease of 0.2p.p. on the previous quarter, and up 0.4 p.p. over the year.